Investing and accumulating wealth is not a trivial matter, especially when investors are torn between avoiding risk and striving for returns. Simple habits can help you accumulate capital calmly. After all, your money should be working for you, not the other way around. Here are the 7 habits of successful investors that we’ve witnessed over the years. The ups and downs of the world’s economies and successes or failures of businesses get priced into investment values. As a result, it never sits still, it’s important for a hopeful investor to get into a habit of consistent research. Keeping yourself on top of world news is a must, and will also help you understand how various events affect the value of stocks and currencies. Successful investors have an accurate reason behind every stock buying or selling decision and it’s not because they heard a TV analyst pushing the stock as a buy. Investing is synonymous to well contemplated decisions. Successful investors rarely make impulsive decisions with their investments. The exclusivity of investing lies in thoughtful analysis and the resultant decision. Likewise, this moral perseveres during short term volatilities too. Successful investors may sometimes underperform the Index but provide for overall outperformance in the long haul. Successful investors understand the process and the functionalities of the business they invest in. This is garnered through diligent research of various constituents that impact the business in question. Along with this, having a dynamic strategy holds equal importance. Strategizing helps in dealing with the uncertainties of the market. Investors decide on a strategic allocation between financial instruments that suit their risk profile and use it to steer through turbulence in the capital markets. In recent years, it has been the equity markets, particularly, that have sent us on a roller coaster ride. That investors want to avoid equities due to price fluctuations is more than understandable in these circumstances. In doing so, however, they overlook the risk of losing purchasing power - which is even more unpleasant considering that interest on savings is virtually zero at the current time. If you want to preserve your capital, you should therefore not focus primarily on the absence of price fluctuations. On the contrary, the minimum requirement for an investment should be “Capital preservation”. Successful investors take efforts towards understanding the business risks and assess areas where their capital may be at risk. If you want to accumulate capital over the long term, you invest in it for the long run. 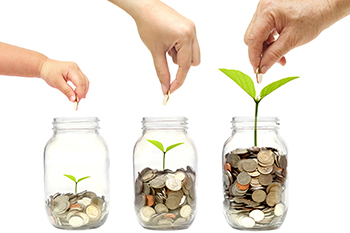 Putting your capital to work over the medium or longer term is one of the main drivers of long term wealth creation. Successful investors like Warren Buffet have made billions through their long term investments made in well apprehended businesses. However, they are nimble footed to close their positions if tides turn against them. Another habit seen in many successful investors is constantly honing their diversification strategy. Diversification is one of the most important staples of investing. To start with, you can probably find some tried and tested diversification strategies, which will reduce the risk you have to take and increase your odds of making a profit. You may find a set tactic which works out pretty well for you. However, you should always be looking for the next way to make the strategy better. Investors also opt for active management not only in the hope to earn additional returns; they are also exposing themselves to less risk of the deadweight of laggers of the equity market cluttering up their portfolios. In markets, a sector/ instrument may be in its boom phase and may end up lagging after the sectors growth prospects weaken. Accordingly, successful investors move investments to sectors with growth prospects. They also believe in taking immediate actions once they assess their investment’s recent developments contradicting their rational. They can afford momentary value depletion but not contradiction to their investment rational. The only way to outperform the index or make long term wealth creation possible is by being ahead of the curve. Consequently, investors are always looking out for growth opportunities. Successful investors always invest in what they know and focus their investing efforts within their circle of competence. Why would you like to invest in a technology company if you don’t know anything about tech? Stick to what you know well. If you’re detached with the business and their products, and the industry in which they operate; it will be harder for you to make smart investing decisions. Thus, these qualities along with passion to grow and discipline to stay consistent make up for a successful investor over time.